Cable assemblies are the key components in any electrical circuit. However, it is one of the most overlooked components as well. If you plan to design cable assemblies for your upcoming project, there are certain considerations to be made. This post discusses 9 such upfront factors that need your attention while building custom cable assemblies. Electric Requirements: This is the basic consideration for any electrical project. Some of the primary considerations to be made include operating voltage, number of contacts, operating current, partial discharge requirements, etc. This step will help you source appropriate materials for the assembly. Application Environment: This is another major factor to consider. Where will be these cable assemblies used? Whether they will come in contact with chemicals, gases, or other elements? How will the cable behave when subjected to thermal stress, heavy loads, or repeated movement? Type of Cable: The type of cable to be designed will become clearer, once you complete the first and second step. There are various cable options available for your consideration, if you wish to build custom cables. Also, you need to consider whether the cable needs a shielding, or whether it should remain extruded, triple extruded, etc. Whether it should be flat, or round, or how many conductors it should have, etc. Conductors: The number of conductors to be included in an assembly is determined by the application where it will be used. However, copper is the most popular, and versatile conductor material used. If breaking strength of the conductor is a problem, then copper alloys or copper clad steel alloys are perfect. Sheaths: Insulators can be availed in Thermoplastic or Thermoset compositions. The thickness, material, and type of insulator will be determined by the application, where they are to be used. Twisting of Wires: The twisting is performed to reduce impact of EMI (Electromagnetic Interference) from external sources. Twisting pairs of cables is performed to avoid noise problems in cables used in telecommunications. You need to make considerations regarding twisting depending on the application where cables are to be used. Shielding: This is performed to control RFI/EMI of cables. The shielding is conducted, once the pairs are cabled together. There are several shielding options available for your consideration. Each option has its set of advantages and disadvantages to consider. The metalized foil adhered to polyester backing is one of the most common shielding options available. Braided and shielding are the two types of shielding options to consider. However, the best EMI protection is provided by the combination of braid and foil shields. Connectors: The choice of connectors will depend on the type of signal to be transmitted. If a high speed signal is to be transmitted, a welded type of assembly is used. However, in case of a regular power, a crimp connector is perfect. Safety Certification: This is the most important consideration, while designing a wire harness or cable harness. For instance, in North America and Canada, cables need to have UL and CSA certifications. The above mentioned are few factors that you need to consider while designing a cable assembly for your application. However, each specification should be addressed prior to designing. Avoiding or disregarding these factors may affect the overall performance of your cable assembly. 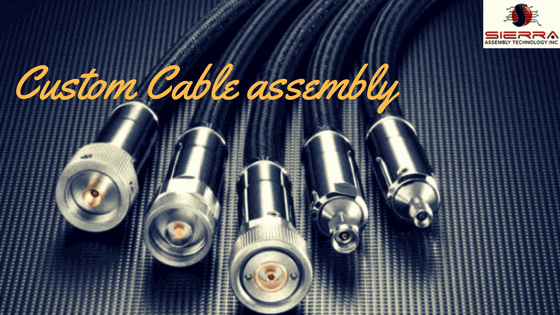 If you are confused about the appropriate specifications, you can always approach a reputed cable assembly manufacturer, such as Sierra Assembly. The company provides custom cable assemblies to its clients in diverse industrial verticals.